Veracruz, bathed by the waters of the Gulf of Mexico, is located in the eastern part of Mexico. It thrives as a symbol of the country’s culture and history, famed for its abundant natural wealth and lands filled with history and the aroma of coffee. Here Breaking Travel News reporter Eleanor Hawkins joins a trip operated by local tour operator Totonal to find out more. Veracruz hugs the Gulf Coast of Mexico. The third most populous state, it provides a large proportion of the country’s food and most of its fuel. Home to at least 2,000 indigenous communities, the state has a rich cultural history. During a recent visit to Mexico for Tianguis Turístico, I travelled with Totonal, a Mexican tour operator offering ethical, sustainable trips around the less well-explored parts of the country. By building relationships with local people, Totonal allows non-natives to experience the beauty of Mexico in a way that helps preserve the natural surroundings and directly benefits local communities. Landing, we start our trip in the port city of Veracruz, itself popular with Mexican tourists. A few buildings of note dot the promenade along the seafront, but the main spectacle is the bustling port and its giant industrial boats. The town itself has a slightly dilapidated, seaside tourist feel and perhaps isn’t a place you want to spend your entire vacation in. However, the colonial Diligencias Hotel was an ideal base from which to travel to the surrounding beaches, archaeological sites and to explore the city itself. Diligencias Hotel was built in 1795 and is situated right on Zócalo, the city’s main square. My large room had a huge, solid double bed making for a comfortable stay. A small but perfectly formed pool overlooks the Zócalo and the Catedral de Veracruz, as well as providing refreshing relief from the humidity. Restaurants line one edge of the well-kept plaza. The customary town hall, cathedral and commercial buildings of Mexican town squares surround a stage where locals enjoy dancing to the live music of a festival on our arrival. The traditional, and aptly named ‘dancon’, or slow dance, is performed by stoic faced couples who hold each other close and move with tiny precise movements. This at first seems counterintuitive for the normally expressive Mexican people – that is until you try any kind of activity in the oppressive heat! Like most tourist hotspots across the globe, venders going table to table on the restaurant’s terrace can be a little pushy, but among them are an assortment of musicians. They play mariachi, dancon, salsa and the recognisable ‘La Bamba’ - a traditional song claimed by Veracruz - and will serenade you at your table for MEX$80 per song. The restaurants in town serve a mixture of local and national dishes of varying quality, so ask for recommendations where you can. For some finer dinning we enjoyed seafood at La Parroquia. Taking full advantage of our guide’s local knowledge, we headed past the touristy main square to find Plazuela de La Campana; a popular local hotspot. Two cafes serve traditional dishes, seafood and drinks at affordable local prices. At around 22:30 a live band starts up and couples take to the dance floor. Popular with all ages but perhaps more appealing to older couples, families gather to chat and dance the night away. Open Thursday-Sunday, live acts play an assortment of music from salsa to dancon and it is well worth passing the evening, waiting to be invited to dance by the many obliging gentlemen. You may be asked to pay 50 pesos for the live band, but this is a trifle for the fantastic atmosphere. Cempoala, an impressive Totonac town just up the coast from Veracruz was pivotal in Cortes’ conquest of the Aztecs. The majestic ruins of various temples made from river stone survive to this day in the town of ‘20 aqueducts’. Once home to 30,000 Totonac, Chinantecs and Zapotecs, part of the site was rediscovered as recently as the 19th century and is now one of the region’s main tourist attractions for Mexican tourists. Just outside of town is the Fortress of San Juan de Ulúa, built from 1565 onwards from bricks of coral. The complex houses a prison, fortress and presidential palace. 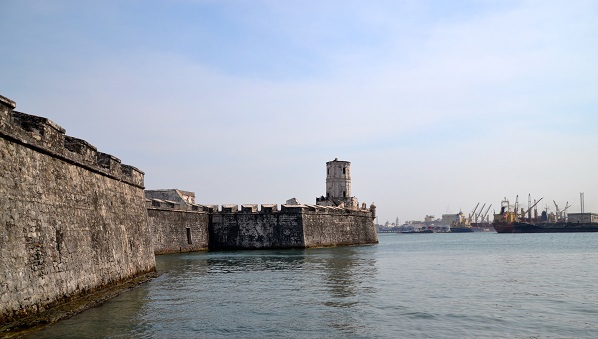 The fortress offers awesome views of Veracruz just across the bay. An important historical landmark in Cortes’ colonisation of the Aztec Empire, it has a rich and intriguing history. There are few information boards, so to really get an idea of the part the fortress played in Mexican history, a guided tour is recommended. A must see and only a couple of hours drive from the city of Veracruz is the pre-Hispanic cemetery of Quiahuiztlán, located on the terraces of the hill and over-looking the sea of Villa Rica. The Totonac cemetery comprises over 70 tombs and two pyramids. 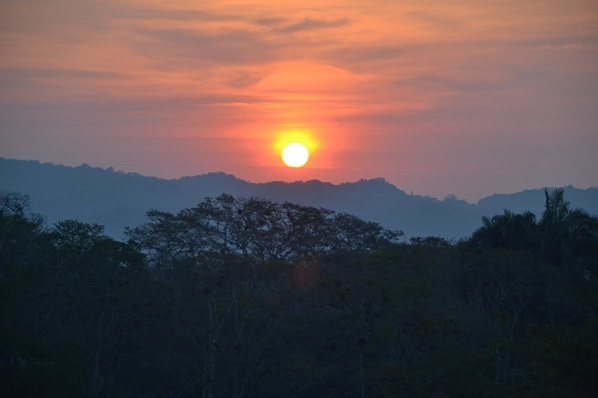 Offering stunning natural scenery and a glimpse of the rich cultural history of the period before the arrival of Cortes, many of the buildings have avoided the destruction that tourists often bring to such places. Quiahuiztlán is an indigenous Nahuatl word meaning “place of rain”, and we were warned to bring umbrellas while in the region, as daily rain showers are common. However, the gods must have been smiling on us as we were lucky and they weren’t needed once. We take in the lush surroundings of coffee and sugar plantations on our road trip to the city of Córdoba, where the air feels fresher but is still warm. Mexico’s highest mountain, the snow-capped Pico de Orizaba looms in the distance and I’m reminded of just how huge and diverse this country is. The Comfort Inn Córdoba provides basic but more than comfortable accommodation for the second part of our trip, with a lovely garden, if slightly murky looking pool. We use it as a base to travel into the surrounding mountains. 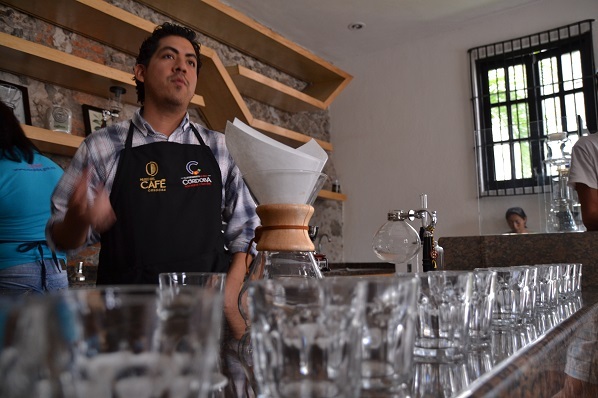 In town, a small modern coffee museum, Museo del Café, sits on the main square and you can take in a lively demonstration by a formally trained Barista who will talk you through different methods of preparation and try samples of each. But it’s up in the mountains where I really felt the benefit of having a guide provided by Totonal, as we pull over to the side of the road and are urged to take a look at the view - its awe inspiring. The setting for Nicolás Bravo’s heroic bid for independence, the dramatic landscape nestles between two valleys and is as interesting for its culture as it is for the scenery. We eventually arrive at the small community of San Bartolo that sees us continue our coffee theme. Keen guides take us through the beautiful plantation where huge butterflies and humming birds flitter around us and we learn yet more about small-scale organic coffee production. 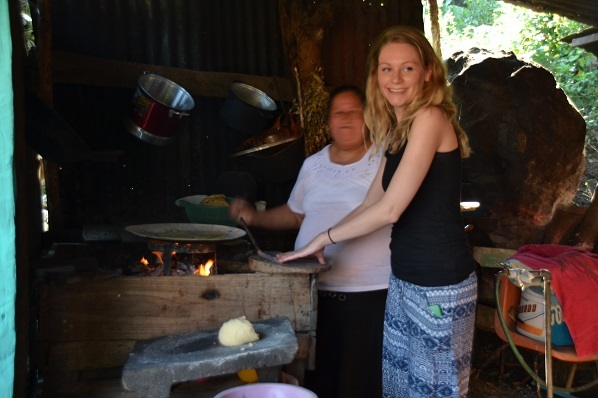 Happy to welcome visitors, the matriarchal community sells local craft and organic coffee products. Totonal works with 25 rural cooperatives such as San Bartolo across the country, helping to create sustainable travel opportunities for tourists to empower local communities like this one. The magical town of Coscomatepec is closest to how I imagined Mexico to be, with cobbled steps, cigar and saddle shops and locals in cowboy style hats. The whole region is steeped in history. Lovely churches with ancient artwork and models of religious figures dot the landscape. The mountainous region is popular with hikers and mountain bikers - both great ways to really get a feel for the place and less destructive to the environment than quad bikes or road tours. We take in a walking tour of the town, one of Mexico’s Magic Towns - a government initiative to acknowledge and reward towns of outstanding beauty. 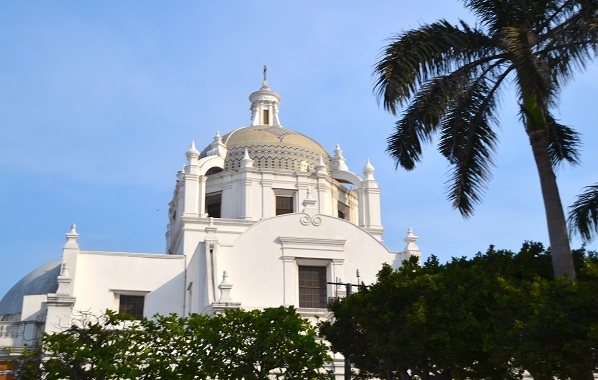 With forests, mountains, beaches and cities, Veracruz provided a fantastic setting for a diverse holiday. Traveling with Totonal I felt I got a privileged glimpse into the way some indigenous people make their living and a feel for the area’s cultural past. Veracruz is divided into seven regions, each boasting a unique environment and ecosystem. Visitors are lured by the opportunity to have a good time by just relaxing or by trying the many adventurous activities offered throughout its verdant lands, such as diving, snorkelling, camping, kayaking, fishing, hiking, and river rafting. Words: Eleanor Hawkins. Images courtesy: Totonal Viajes que Iluminan.